Everyone likes software or firmware upgrades. From iOS4 to iOS5, from Android GB to ICS etc. Same goes to Synology NAS. I am like everyone but after years learning from bad experience, nowadays I don't jump into the bandwagon to upgrade when a firmware is freshly released. I am more concerned over my data than getting new features. 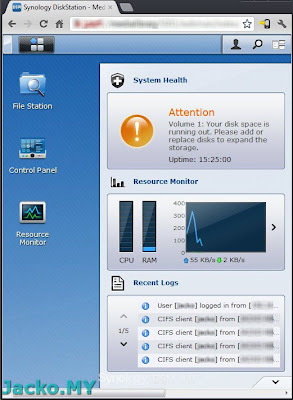 Synology recently released DSM 4.0. 3 releases/patches have been announced under DSM version 4.0. After much study from others' experiences, I reckon it's safe for me to upgrade. This post is the summary of my study, I thought it's worthy to share if you are deciding to upgrade or not. Hit the read more link for more. First, I was on DSM 3.1-1748, both my DS209 and DS1511+. The DS1511+ volume was created with DSM3.0 and volume in DS209 was created with earlier version i.e. 2.3. I can't upgrade to DSM4.0 directly or else I would be hit by the infamous BlueLED Blink Of Death, BBOD problem as reported in this thread. The root cause was identified and provided here. 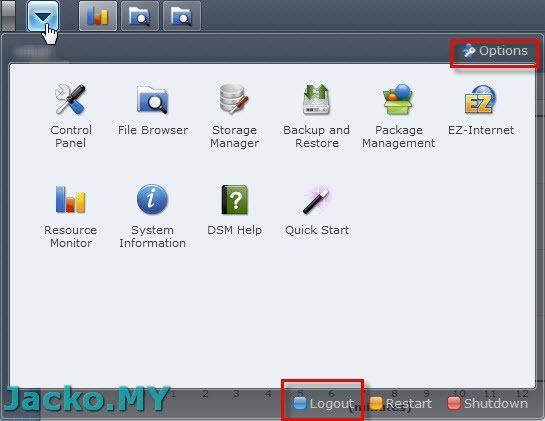 So DO NOT upgrade to DSM4.0 if your Synology NAS volume was created with DSM version prior to 3.1. Second, there's a limitation of maximum 16TB per volume, if the volume was created with DSM version prior to 3.1 as reported in this thread. My DS209 will have no problem but my DS1511+ will be hit by this limitation as I am in the midst of getting the DX510 expansion unit. So if you own a model with expansion capability, do consider this if you are to have a single volume spans across multiple expansion units. Third, the write cache disablement issue. If you use certain HDD models, mostly Western Digital Green series, the write cache will be disabled by DSM 4.0, as reported in this thread. Check out this post to see if your HDD model is in the list with "write cache off". Some users reported here that Synology has allowed users (than enforced) to decide themselves whether to enable or disable the write cache in version 4.0-2228. Bottomline, read more on the forum before making decision. 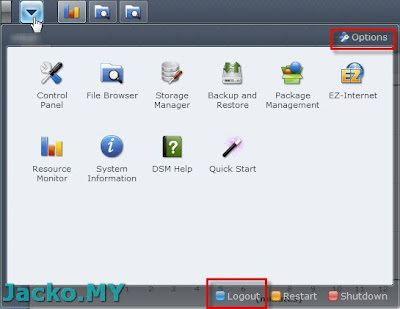 The user-specific setting like logout has been moved from the left to the right. This might annoy some users who used to the old interface. 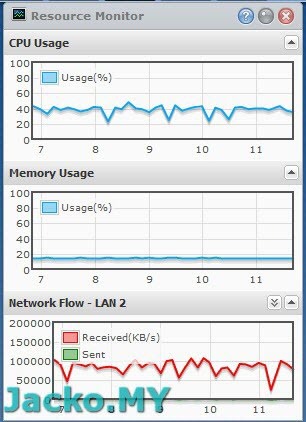 User with administrative privilege will get this widget on the desktop, giving an overview of the system performance. Admin can also kill any active user connections via the widget. There is no % progress in DSM 4.0. This looks more like a bug as I do get the % in an occasion. 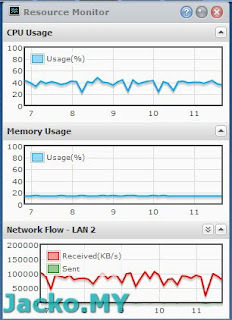 The charts were captured with file copy (over NFS mount) tests between two DS1511+, one running DSM 3.1-1748 and the other DSM 4.0-2228. The left chart was captured when file copy was initiated from DSM 3.1 (copy from DSM 4.0 to DSM 3.1) and the right was initiated from DSM 4.0 (copy from DSM 3.1 to DSM 4). Both copied the same folder content. It appears that the performance was quite par between the 2 versions in terms of CPU (~40%) and memory usage (~20%), as well as network throughput (~100MB/s). 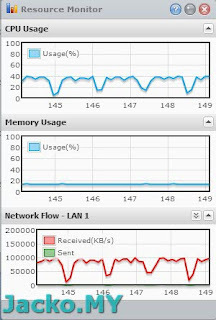 However, DSM 3.1 shows a very deep dip in throughput every minute, seems like needing a deep breath before continue. On the other hand, DSM 4.0 never shows such a dip but rather decrease and increase in throughput throughout the task progress. Nevertheless, both tests finished in more or less similar duration. I have no knowledge over such behavior, please share your comment if you know the cause. That's what I discovered thus far, I will share more when I have time to explore. Thanks for your Tuto !! You're writing "So DO NOT upgrade to DSM4.0 if your Synology NAS volume was created with DSM version prior to 3.1." All my Synos was Created with DSM2.6, but all was Updated on DSM 3.1.1613. Check the links above in the same paragraph or here. Simply say, your volume MUST be created with DSM DSM3.1-1748 and above. If you don't, you might hit into system malfunction when upgrade to 4.1 as described in the link.